Two Russian cosmonauts will take a spacewalk outside the International Space Station on Monday, Aug. 10. Expedition 44 commander Gennady Padalka and flight engineer Mikhail Kornienko will retrieve an experiment and install so-called "gap spanners" that will make future spacewalks easier for the station's crew. Two Russian cosmonauts will venture outside the International Space Station today (Aug. 10) in a spacewalk to install equipment, pick up an experiment and take pictures of the station. Expedition 44 commander Gennady Padalka and flight engineer Mikhail Kornienko are expected to exit the Russian Pirs airlock at 10:14 a.m. EDT (1414 GMT). You can watch the spacewalk live online beginning at 9:45 a.m. EDT (1345 GMT), courtesy of NASA TV. The cosmonauts' primary task will be to install gap spanners on the station's hull, which makes it easier for spacewalkers to move around while doing their work. The veteran spacewalkers will also clean the Zvezda service module's windows, put fasteners on exterior communication antennas, replace an old rendezvous and docking antenna, and take pictures of the station exterior. Padalka and Kornienko will also pick up an experiment called the Obstanovka Experiment. 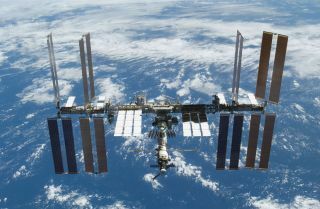 It was first deployed in 2013 and is intended to examine how space plasma (superheated gas) affects surfaces on the hull of the International Space Station. This will be the 10th spacewalk for Padalka, who has spent the most time spacewalking of any human. Kornienko will be on his second spacewalk. This will also be the 188th spacewalk at the space station. Kornienko is five months into a one-year mission on the space station, along with NASA astronaut Scott Kelly. The goal of the mission – twice as long as a typical space station stay – is to see how the human body reacts to extended periods in microgravity. Only a few people have stayed in space for a year or longer; they were all Russian cosmonauts aboard space station Mir in the 1990s. On the U.S. side of the station, NASA began spacewalks earlier this year to prepare the space station for docking new commercial crew vehicles from SpaceX and Boeing. These spacecraft will fly to the space station no earlier than 2017. The International Space Station is currently home to six space travelers representing Russia, the Untied States and Japan. In addition to Padalka, Kornienko and Kelly, the station is home to Russian cosmonaut Oleg Kononenko, NASA astronaut Kjell Lindgren and Japanese astronaut Kimiya Yui.